Posted by Bethan Ruddock on 19 April 2018 in Events, NBK and tagged NBK. Jisc will be delivering more sessions than ever at this year’s UKSG conference in Glasgow. The scale reflects the breadth of our activities and where we are engaged on behalf of or in partnership with you, our members to deliver on your needs. Our sessions include a number on open access from Liam Earney’s plenary with the National Library of Sweden on licence negotiation and the transition to open access to Chris Keene and Bas Cordewener exploring the challenges of open scholarship. Graham Stone explains the latest iteration of TERMS incorporating open access management alongside Peter McCracken from Cornell University and Jill Emery from Portland State University Library. Other sessions demonstrate how Jisc is helping to support teaching and learning in FE and developing new funding models with a crowd-sourcing approach to digitisation. We also highlight how our analytics work is helping libraries to deliver impact through data visualisation initiatives. We also explore the negative impact for libraries and their users of poor quality metadata in the electronic resource supply chain. And finally there are two lightning sessions highlighting our approach to redeveloping our library support services and we present our Liberate service, an easy and affordable solution to managing access to digital content. We also have an additional session on delivering the NBK vision in partnership with OCLC and you can register for this special NBK session via Eventbrite. See our Events page for full details of all our sessions and come and visit us during the conference at our exhibition stands 47 & 49. Come and speak to Siobhán Burke at the stand, where you can find out more about our transformation programme, and sign up to help us with our development to improve our services. Posted by Siobhán Burke on 26 March 2018 in Events. NBK Phase 1 Complete – Join Us for Phase 2! The National Bibliographic Knowledgebase (NBK) is a transformative new national service that will aggregate bibliographic data at scale and link with a number of other data sources to help users to more effectively find, access and use print and digital scholarly resources. It will also greatly enhance the ability of libraries to more effectively manage and develop their collections. After a two year development period (alpha and beta phases) we are aiming to launch the ‘live’ service in January 2019. Last month we formally got started on phase 2 of developing and building the NBK. There is so much to do, so many meetings to attend and things to discuss, that it’s taken a while to find the time to blog about it. The first project ‘alpha’ phase of the NBK ran from February 2017 until January 2018 and was principally focused on three main objectives. The first was for OCLC to install a new instance of their metadata management system (CBS) onto their infrastructure and to set it up to begin handling data from UK libraries. The second was for Jisc to get a substantial number of fresh loads of catalogue data from contributing libraries and to pass them across to OCLC for processing. And the third was for Jisc and OCLC to work together to provide a beta interface so that libraries can check their data and the community as a whole can see that progress is being made. How did we get on? Well … I’m pleased to announce that we have ticked off all three of those first phase objectives. As of February 2018 we are already loading data from 60 institutions onto the NBK and more than 40 additional institutions have so far signaled their intention to participate. Whilst the NBK interface is openly available for all to look at, it is worth noting that it’s very much a “work in progress” and needs more refinement and development. We have made it available in its current form so that contributing libraries are able to take a look at the data they have sent and to work with us to enhance the record matching and processing procedures that are at the heart of the NBK workflow. What’s Next for the NBK? The first thing we have to focus on in the next phase is to continue reaching out to more libraries to invite them to commit data into the system. If you would like your data to feature in the NBK, the first step is very simple. Just drop us a line at: nbk.copac@jisc.ac.uk. We will then ask you some questions about your data and then help you at every stage of the process. We think that having a comprehensive record of the holdings data of UK academic and specialist libraries in one convenient location is a very compelling proposition but we realise that we need to keep on making the case and offer tangible benefits to convince many libraries to push this activity to the top of their priority list. The universal benefit for libraries to join in with the NBK is that we want to make UK library data much more discoverable wherever users are trying to find resources. Overall, we want to make a much richer diversity of resources available to researchers and learners so that science and scholarship thrives. But more practically for libraries, our aim is to steer users of the NBK towards library resources and into the library environment. Another primary use case of the NBK is to enable libraries to make data-driven decisions about the management and development of their collections and to deliver value, savings and efficiencies to libraries and their host institutions. By providing the most comprehensive view possible of the holdings of libraries across the UK, it should become feasible for institutions to more accurately compare and benchmark their collections and to more easily collaborate with others in consortial, regional and national groupings. We have a number of exciting and challenging tasks to tackle in year 2 of the NBK and we want to work very closely with the community to realise all the potential benefits. We have set up some community data groups to work on issues relating to data quality and efficiency and we are hopeful that they will design tools, advice and guidance that will help libraries align around best practice. (We will be posting more information about these groups when work proposals are agreed). We are talking to commercial data suppliers to better understand how data enters into and circulates around the bibliographic data ecosystem; and how we might design a data marketplace that is as efficient and as fair as possible. We will be looking very closely at all of the requirements around user interface design and the component tools and service layers that we can provide over the core aggregation. During the course of this next phase we will develop requirements and implement: a fully featured discovery interface; a contributor dashboard; collection management tools; and catalogue record upload and download components. We will also be paying very close attention to how we most fairly apportion the costs and responsibilities of sustaining the NBK and how this relates to access rights. The next twelve months will be a busy and highly collaborative period for Jisc and OCLC working closely with academic and specialist libraries. We very much want to hear from you so don’t hesitate to drop us a line if you have any questions about any aspect of the NBK. Posted by Neil Grindley on 13 March 2018 in NBK and tagged libraries, metadata, NBK. We are pleased to announce the launch of a beta NBK resource discovery interface. At launch, this contains data from 43 NBK libraries, and over 6.8 million records. More libraries will be added during 2018, as their data is received and processed. The beta resource discovery interface is primarily aimed at allowing contributing libraries to check and assess the processing of their data and the data matching procedure, and to give us feedback on how bibliographic and location data is handled. As we will be making changes based on this feedback, the NBK data handling in this beta interface should not be considered stable. Contributing libraries will be sent information about how to supply feedback. While other users are welcome to use the beta resource discovery interface, please be aware that neither the design, functionality, nor coverage reflect what will be available at the launch of the full NBK resource discovery interface in 2019. A separate project to design the NBK resource discovery interface will be running during 2018, and we are not currently requesting feedback on the design or functionality of the beta resource discovery interface. Posted by Bethan Ruddock on 15 February 2018 in NBK and tagged NBK. Our new strategic advisory group held its second meeting last month and is now fully up and running and in position to provide advice and guidance to Jisc on key developments that we are working on and engaging with on behalf of libraries. Our chair is Mark Toole, Head of Libraries and Learning Resources at Nottingham Trent University and formerly the chair of the Knowledge Base+ Advisory Board. This was one of the groups from which this new group has emerged, the other being the Bibliographic Data Oversight Group (BIBDOG). To ensure that we had the most representative group we sought new members to ensure a variety of different institution types were represented, including Scotland and Wales. The group also includes representatives from our key sector partners and stakeholders: the British Library, RLUK and SCONUL. There are also members from Jisc whose responsibility is to update the group on Jisc activities and coordinate with other parts of Jisc, in particular our Open Access team. There is also coordination with other strategic groups such as the Jisc Collections Content Strategy Group (JCCSG) and the Collection Management Community Advisory Board ensuring we avoid operating in isolation and benefit from an open and shared, strategic approach. A full list of the group’s members is available on our Members page. Among the key areas now recurring on the agenda are the National Bibliographic Knowledgebase (NBK) project and the Transformation of Library Support Services (TLSS) programme, including the redevelopment of the Jisc Collections website. The latest meeting was an opportunity to present our progress and get a steer on next steps. This is especially important where we will need libraries to actively work with us to achieve project goals, for example, supplying catalogue data to the NBK and working together to ensure that the data is as comprehensive, accurate and consistent as possible. We also presented a draft for comment of Jisc’s priority development goals for 2018 – 2022. This included a number of challenges for libraries and how Jisc could develop its services to assist in resolving those challenges. We have clear aims for this academic year so we sought feedback on new areas for 2018-19 such as use of analytics to improve student learning experiences and a potential role for Jisc to play in training around data literacy. On the data and analytics side, feedback was that libraries have useful data to contribute, for example, reading lists, and that this is an area that we should pursue. In fact, our Learning Analytics project is already exploring this and other library data. For training, partnering with SCONUL was a welcome suggestion and to develop communities of practice rather than Jisc developing and delivering training itself. The terms of reference for the group are now available and you can also read the minutes from the first meeting in March 2017. The minutes for the December meeting will become available following approval at the next meeting later this year. Presentations from the meeting are available on the TLSS programme and NBK. Posted by Siobhán Burke on 23 January 2018 in Advisory Group. We would like to convene some funded community groups to look at issues and possible interventions that might be made to enhance the quality and efficiency of library bibliographic and holdings data. As well as being of broad sectoral benefit, the objective of these groups will be to work on a set of structured challenges that will help to make the NBK data processes more efficient and the data in the NBK more effective. The challenges would build on the recently published ‘Understanding Collections Overlap’ report and the groups will be expected to creatively determine their own approaches and responses to relevant data issues. In all areas the groups would be required to work closely and collaboratively with NBK service staff but it is anticipated that the issues in question will be ones that individual libraries will want to make progress on for their own benefit – as well as for the purpose of improving the quality and effectiveness of data across the sector and within the NBK. A modest level of grant funding will further incentivise libraries to participate and will also ensure that Jisc is correctly positioned to use the outcomes as exemplars for the sector and to exploit the body of work as an NBK-related community resource. How to optimise descriptive library metadata to most accurately describe collections for the purposes of the NBK? What are the implications and conditions for libraries to accept a consolidated and enhanced ‘master record’ back into their local library catalogue? How to work most effectively with different LMS systems in relation to the NBK and what is required in terms of information for vendors and peer support for solving technical issues? What interventions would be most effective to optimise serials data for inclusion into the NBK? How should the NBK toolkit/manual take shape and how should it be designed in terms of content and format so that it is most useful for the community? Groups will be invited to bid for a grant that will go some way towards defraying the cost of participation – probably using a fairly low standard day rate. These grants will be negotiable depending on the number and nature of the groups proposed but would most likely be in the range of £10k – £20k per group. It would be helpful if you could state your role and affiliation and very briefly describe any specific interests you have in tackling library data quality issues. Please also insert “NBK Community Data Groups” in your subject line so that we can easily identify the nature of the message. Posted by Neil Grindley on 14 December 2017 in Data, NBK. Over 40 libraries have contributed to the National Bibliographic Knowledgebase (NBK) so far. Will you be next? We’re very pleased to report that we’re over half-way to our target of having 75 institutions represented on the NBK by the end of January 2018. We’ve just sent over our 40th and 41st institutions to be loaded onto the database, and we now have a great cross-section of UK HE and specialist libraries represented (see below for the full list), including some whose data was not previously available through Copac. And we have many more exciting institutions signed up to contribute over the next few months. Will you be one of them? But our work is far from complete. Our aim by 2020 is to have every UK HE library included in the NBK, along with a healthy selection of specialist research libraries. This unprecedented scale and coverage will uncover the shape and scope of the national research collection. This will allow decisions to be made at a truly national level, while comprehensive local coverage will support robust regional and consortial decision-making. So we’re issuing an invitation to all UK HE libraries to contribute their data. You may have been contacted already, but if you haven’t please don’t feel that you have to wait for us to contact you! With over 200 libraries to talk to we are very happy for you to initiate the conversation. The NBK is provided as part of your core Jisc subscription, and there is no extra charge associated with contributing. If you would like to more information, please contact nbk.copac@jisc.ac.uk and we would be happy to discuss what it means for your institution. If you’re ready to get involved now email nbk.copac@jisc.ac.uk and we’ll tell you what information we need from you and how you can send us your data. All of the supporting documentation is available on our contributor website https://contribute.copac.jisc.ac.uk (login with your usual institutional Shibboleth ID). Posted by Bethan Ruddock on 21 November 2017 in NBK and tagged NBK. We were very pleased to be invited to speak at the EPUG-UKI conference earlier this week, where we gave an update on the current progress of the NBK, and extended an invitation for all UK HE libraries to contact us if they’d like to discuss contributing data. Slides from the event are below, or downloadable from Slideshare. Posted by Bethan Ruddock on 20 October 2017 in NBK and tagged NBK. Lots of work is going on in the Jisc National Bibliographic Knowledgebase (NBK) project to get the new database built and populated with data loads from UK HE and specialist libraries. The database is being built by OCLC, on their CBS software which is already used to power national and regional bibliographic infrastructure in a number of countries, including in Australia, France, Germany, Switzerland and the Netherlands. Users of CBS attend a partners meeting once a year, and last week the Jisc NBK team attended our first partner meeting. This was an excellent chance to hear about the initiatives being undertaken by other CBS partners, and how they’re using CBS with other technologies to power bibliographic and knowledge services. We were particularly interested by work being done by BSZ and GBV (VZG) in Germany, ABES in France and SwissBib in Switzerland which reflects many of the needs and use cases of the NBK and other Jisc Library Support Services. It’s reassuring to know what we are in line with the forefront of European bibliographic development, and to identify potential partners for knowledge-sharing. Another important factor was to hear about how data from CBS can be used and customised for use with other systems. The NBK is committed to the Jisc Library Support Services Transformation project, and we need to ensure that the services that are built on the NBK reflect and conform to the Jisc LSS principles. The first of these services, and your first chance to see the outputs of the NBK project, will come in January 2018, when we will be releasing the beta version of the Jisc NBK Resource Discovery Service. Posted by Bethan Ruddock on 22 September 2017 in NBK. Library Data Labs goes public! The 12th Performance Measurement in Libraries conference has just concluded in Oxford and provided Jisc its first opportunity to publicly present the outputs of the Library Data Labs project, which ran in the summer of 2016. This is a Jisc and HESA collaboration to deliver community developed interactive, visualised dashboards via HESA’s Heidi Plus service. The presentation included demonstrations of the outputs which will be available for HESA members to use from September 2017*. Benchmarking user satisfaction levels with library facilities. Using a number of parameters to build a set of comparable groups, this dashboard allows the user to better compare like with like and see the effects on the NSS scores. Space Analysis v footfall & satisfaction. This dashboard presents options for each of the SCONUL space measures plotted against NSS scores to highlight where there may be correlations. SCONUL Key Performance Indicators. Presenting key SCONUL measures as KPIs, allowing the user to benchmark their institution against their peers. Teaching Excellence Framework NSS Explorer. This dashboard brings together the NSS scores with key SCONUL measures overlaid to show the variance of that measure, e.g. spend varies with NSS score. Mind blown by @JISC library labs project in the Main Hall. The presentation did not end there. The 4 dashboards going into service were not the only outputs from the Library Data Labs. 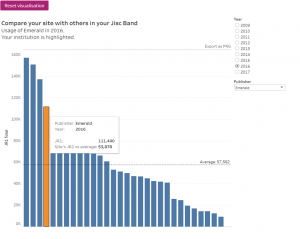 Some of the development work has since found a more relevant place as part of Jisc’s Learning Analytics project as this project moves into a phase focusing on library data. 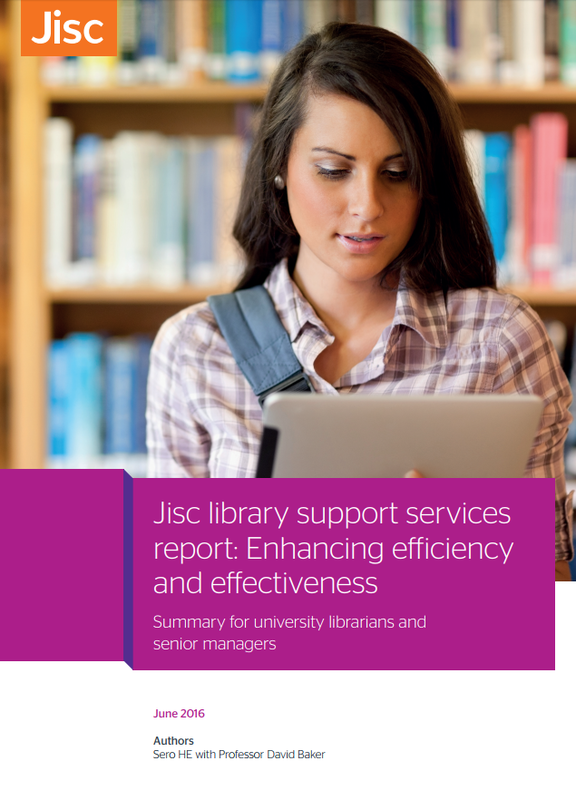 In addition, the Jisc team who took part in Library Data Labs, have also taken forward their work from this project to the point where the JUSP service have developed new functionality for the service. In autumn 2017, a range of dashboards will be available to JUSP users based on a number of reports. The image below gives a flavour of what will be available. And finally, there has also been a subsequent Library Labs team recently finished in July this year. That team have developed new dashboards including one showing NSS scores for all HE institutions versus key SCONUL metrics on expenditure over time. These will also go into service in September this year. The full conference proceedings, including a more detailed paper on this presentation, will be available later in 2017 or early 2018. Posted by Siobhán Burke on 3 August 2017 in Analytics, Data. Driving Transformation with the NBK – where have we got to and where next? Bethan Ruddock on Driving Transformation with the NBK – where have we got to and where next? Jane Daniels on Driving Transformation with the NBK – where have we got to and where next?